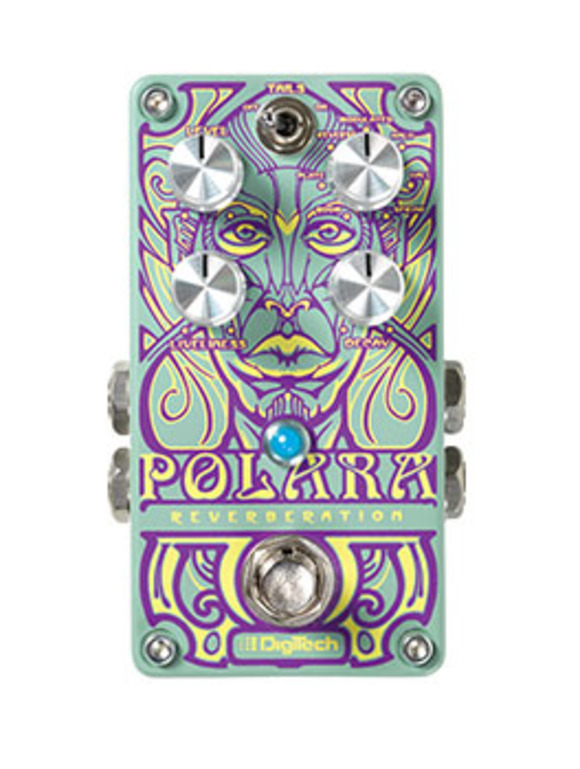 SALT LAKE CITY, Utah – HARMAN’s DigiTech today announced the introduction of its Polara Stereo Reverb Pedal, offering an expansive palette of reverb effects. The DigiTech Polara gives guitar and bass players the depth and dimensionality of seven studio-standard Lexicon reverbs and flexible sound tailoring capabilities in an easy to use pedal with a new, compact size. The DigiTech Polara’s full spectrum of seven reverb types includes Room, Hall, Spring, Plate, Modulated, Reverse and Halo. Room provides intimate warmth, while Hall offers a vast soundspace. Spring faithfully reproduces the “sproing” and surf-music “splash” of classic guitar amp spring reverb, while Plate delivers the unmistakable cavernous sound of the large metal plate reverb units found in well-heeled professional recording studios. Modulated mode adds a richly textured chorus effect while Reverse serves up backwards-tape effects for head-spinning sonic psychedelia. As if that wasn’t enough, Polara introduces DigiTech’s new Halo effect, with cascading octaves interspersed in the reverb decay for a spellbinding sonic aura. The Polara’s Type control selects the type of reverb and its Level knob adjusts the amount of reverb mixed with the dry signal. The Decay control adjusts the length of the reverb duration and a Liveliness knob shapes the amount of high-frequency content. The Reverb Tails on/off toggle switch controls whether the reverb tails linger or are cut off when the effect it switched off. The Polara offers true bypass operation, which keeps the unaffected tone of the instrument intact when the reverb is not in use. It has mono and stereo input and output jacks for easy integration into any pedalboard and rig, and the pedal’s newly designed soft-click footswitch provides reliable, noise-free operation. Included with the Polara is DigiTech’s exclusive gen2 Stomplock™ knob guard that locks the player’s settings in place and prevents accidental changes onstage, and a custom-cut hook and loop pad to securely attach the Polara to a pedalboard.